My passenger door window and lock on my 2004 RSX haven't worked in a couple of years so asked my local mechanic to diagnose. He's a good mechanic but not sure how knowledgeable he is with doors and windows. He says it needs a new window master control switch since power is not going to passenger side. Would that switch also influence the power lock? It seems like a new one costs @ $150 while used ones range from $20-50. Any advice on which way to go? Fuse #22 provides power to the passenger window as does a power window relay. These are located in the under-dash fuse box. Check this first. Also, make sure the window lock switch is not engaged on the drivers side switch panel. The door lock is a totally different circuit and is not related to the window problem. The lock actuator fails and can need replacement or rebuild. If you want to replace it yourself, I highly recommend using an impact driver to remove the latch screws without tearing them up. You can rebuild your actuator using an Ebay replacement motor, but if you do, it's much easier if you buy the motor with the flat already on the drive shaft. There are tutorials for this if you search (and if the photos weren't on photobucket). See if you can locate a PDF of the factory service manual. 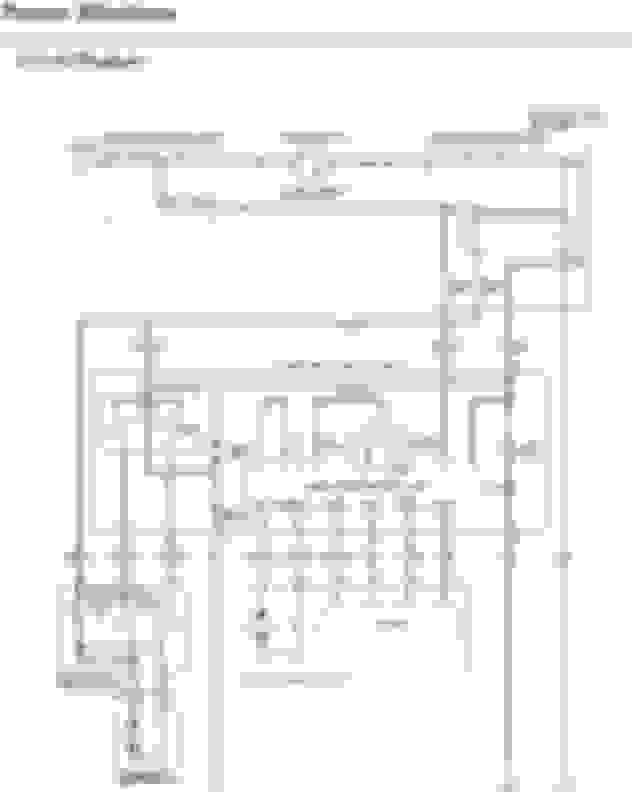 I refer to this for the circuit diagrams I used to help diagnose problems. Thanks! You support my doubts that the master switch would be responsible for both the door lock and window. Will check the fuses but your suggestion regarding the door lock actuator was beyond my technical expertise. YouTube videos were fairly sparse for 2004 RSX's. Do you think that the master switch would be the problem for my passenger window as my mechanic suggested? There is a chance, but not for the reason he stated. Power goes to the passenger switch directly from the fuse, so the master switch cannot be at fault for this. When you use the passenger switch to open or close the window, the master switch is only used as a ground path. See the attached schematic. The "MAIN SWITCH" is the round button on the driver side and would prevent the ground return. If you don't use this switch much, it may have been toggled which will prevent the passenger window from working. The window control works like this: When either window switch is pushed "down", that switch provides power to the motor with the return going through both driver and passenger "up" switches to get to ground. The passenger "down" switch connects power directly to the motor when pressed. The driver "down" switch connect power through the passenger "down" switch to the motor when pressed. I hope you can follow this on the schematic. Unfortunately, the photos were all on photobucket which means they are now all gone. If I understand you correctly, the master switch only affects the passenger window with the window lock. If the window lock is staying locked even though it seems to be unlocked then it would keep the power off to the passenger side. My mechanic says he connected the passenger window to his own power grid and it worked, What he has said about the power lock made no sense to me at first since I didn't see the power lock on the master switch and really less sense with your explanations. I pulled the fuse and it looked OK to my untrained eye but I am going to try to replace that first. I just brought an Accord in to a Honda dealer or a passenger window problem that turned out to be "corroded wire connectors". When I hit the unlock button for the door lock, I hear a noise on the passenger side as if it is working but it is not. I had it in to an Acura dealer a while ago looking at it for a check engine light problem and they said I needed an actuator. Not sure whether they were guessing or they actually diagnosed it. At the time I didn't really want to put much $ into it. It's my son's car. My son just told me he thinks it is related to the time he had a AAA locksmith used a "slim jim" to get into his car when he lost his keys. Is there something that they could have cut in doing that? Power for the passenger window comes from the GRN/BLK wire as shown on the schematic. It also provides power for the switch LED so it should always be illuminated when the car is on. You will need a voltage test light or a voltmeter to troubleshoot this. The lock problem could be the actuator or a linkage issue. If you hear the actuator when you try to lock or unlock the door, it could be as simple as a linkage issue. 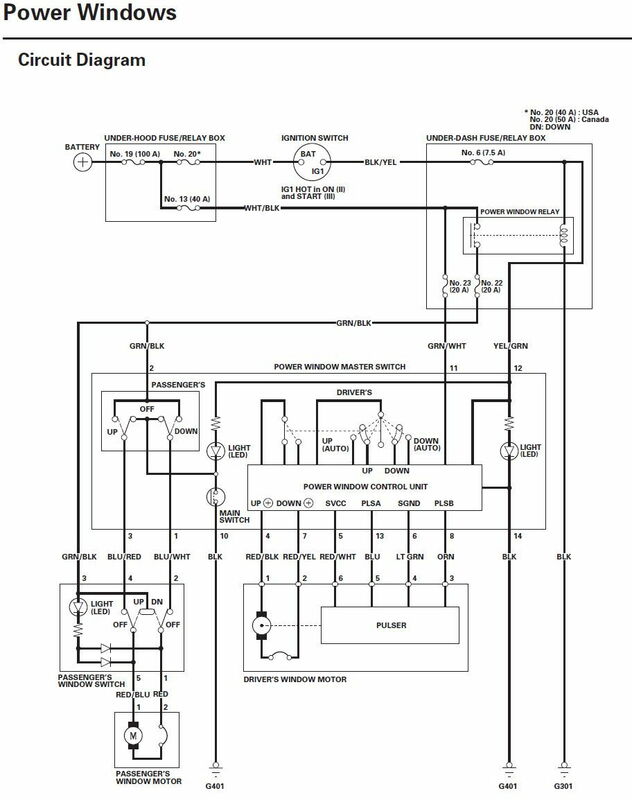 If this isn't something you feel capable of troubleshooting on your own, print out the schematic above and give it to your mechanic to use as a reference. It is almost impossible to troubleshoot these cars without a service manual. The slim jim could have damaged the lock actuator linkage. The window wiring shouldn't be in that area, so is likely a separate issue. I just went out and checked the door locks again. When I use the key from the passenger side it locks and unlocks all 3 doors. When I use the key from the driver's side it locks and unlocks the driver door and hatchback but not the passenger door. When I am inside the car using the switch on the passenger side, it locks and unlocks the the driver door and hatchback but not the passenger door. I'm not sure if it is trying to unlock the passenger side. I hear the unlock sound but it may just be the sound for the driver's door and hatchback. The switch on the driver's side does the same thing. You have been a great help! Does this additional info give you any more insight? I want to be as prepared as possible when I bring it back in to my mechanic. As far as I can tell from the diagrams, the key cylinder directly locks or unlocks the door and also activates a switch which controls the other lock actuators. The door lock actuator is attached to the door latch assembly and controls the lock position. There is a cylinder rod from the key cylinder to the latch assembly which will manually lock or unlock the door. Since these mechanisms all work using the key, there is no linkage problem. The door lock actuator is the problem. The OEM part number is 72115-S6A-J01 which sells online for $50 to $60. Advanced Auto sells a third party replacement for $14.14 and up. This is not an easy repair but can be done yourself. I replaced the actuator on the driver side myself. The biggest problem is you can't see what you are doing inside the door.